Featuring the Green Awareness Ribbon Causes and Gifts. The green awareness ribbon color means support for celiac disease, bipolar disorder, environmental protection, bone marrow donation, kidney disease, cerebral palsy, literacy, arthritis (USA), tissue donation, organ transplant, spinal cord injury, depression, and missing children to name a few. Let this green ribbon support awareness for these causes! The kelly green color awareness ribbon means support for adrenal cancer awareness. It is considered a rare cancer. Adrenocortical carcinoma is also called adrenal cortical cancer (ACC). The human body has two adrenal glands. They are located on top of the kidneys. The gland make hormones which help regulate blood pressure, manage the body’s stress response and more. Do you want to promote adrenal cancer awareness using this ribbon art? If so, please visit non-profit, DonnaBellasAngels.org to learn more. Here are some samples of green adrenal cancer awareness ribbon gifts. World Kidney Day is annually on March 10th! It is a world campaign to make people aware of the importance of their kidneys and treating them right. By creating awareness on this day, the goal is decrease the impact of kidney disease by letting people know about the signs of kidney disease and how to manage symptoms to live with kidney disease. Diabetes and high blood pressure/ hypertension put people at risk for Chronic Kidney Disease (CKD). By increasing kidney disease screening, especially in these populations can find and treat patients earlier in their disease. 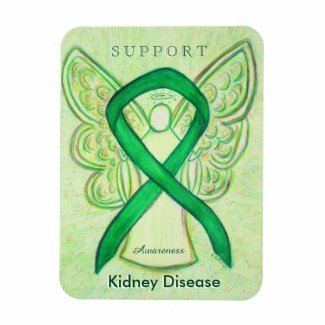 Also for those patients who have experienced kidney failure then to advocate for kidney transplant. Learn more about World Kidney Day at http://www.worldkidneyday.org/. 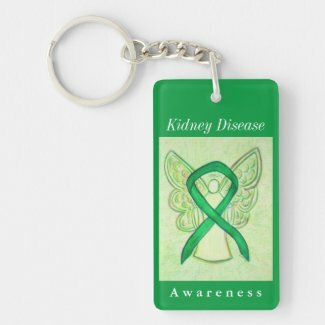 Visit our Angel Awareness Ribbon Art Gallery store on Zazzle to see more Kidney Disease Green Awareness Ribbon Gifts & Merchandise! 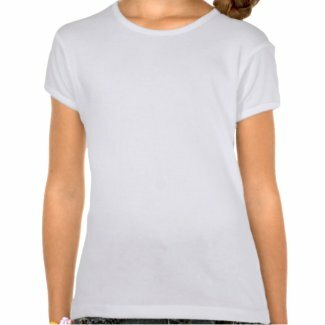 If you want to use the art for a non-profit cause, please obtain permission through www.DonnaBellasAngels.org. Learn more about art royalty use here.